They have faceted sides and textured ends that are enameled in royal blue, giving them a super-rich look. I've added some Bali silver look-alike pewter beads, a large split ring and a clip to make the world's most versatile necklace. Hang an I.D. badge from the clip; remove the extension and use the split ring to hold a bunch of keys; or put the leg of your reading or sunglasses through the split ring ... or a combination of any of the above. The necklace measures a comfortable 31", and the extender is about 7". 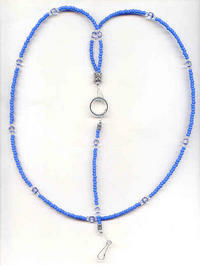 It's made with first quality Czech seed beads, strung on sturdy nylon-over-steel cable. Sturdy, useful, versatile, AND pretty? Naturally, it's from SPARKLE PLENTY. All of our one of a kind and limited edition artisan beaded jewelry is individually handcrafted in our studio in Los Angeles, California. Be sure to check out our other indie boutique jewelry styles and fashion accessories. Bracelets, necklaces and earrings in beautiful contemporary, vintage, antique and retro designs. Planning to give your loved one an important small gift? 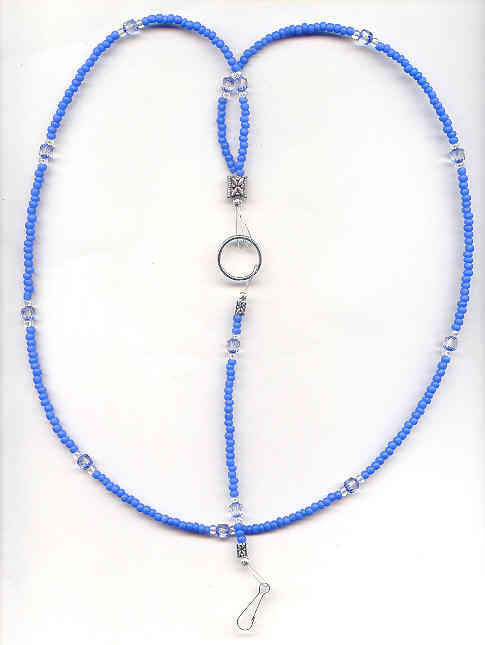 The 4mm firepolish crystal beads that form the basis of the ring are sapphire and pale ice blue, both with a sparkling aurora boreale finish.